Helping to ease the pressure on farmers who lost livestock in the heavy snow is an "urgent priority" says the Welsh government. 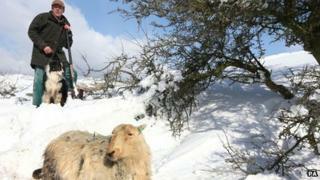 Snow drifts of 15ft (4.57m) in north Wales left hundreds of sheep buried. Now Natural Resources and Food Minister Alun Davies says he has asked Wales' chief veterinary officer Professor Christianne Glossop to look at what can be done to ease the burden on farmers. The Farmers' Union of Wales (FUW) has already called for urgent assistance. "I'm very aware of the extreme difficulties farmers in Wales are experiencing as a result of the extreme weather we have witnessed over the last week," Mr Davies said. "Sheep farmers are facing their busiest time of the year with the lambing season, which is not yet over in some parts of Wales. The extreme weather has put an added strain on them. "One of the most pressing issues farmers have told me they are now facing is how to deal with fallen stock." Mr Davies said that he was also asking farmers to be aware of the regulations stating that they need to dispose of carcasses as soon as possible but also be kept secure until then. And he praised the work of farmers to ensure communities in affected areas are kept open. "Many of our farmers and their families have played a vital role in making sure rural communities in some of the worst affected areas of north and mid Wales have access to essential services," Mr Davies added. "I would like to pay tribute to them for all their efforts in helping and supporting their local communities during what has been a very difficult week." FUW president Emyr Jones welcomed the announcement but called for regulations on burying animals to be lifted or allow carcasses to be collected for free. "We have a ridiculous situation whereby it is illegal under EU regulations to bury animals, and have to pay for them to be removed and disposed of," said Mr Jones. "However, a derogation is available in exceptional circumstances, and we desperately need this to be applied." Mr Jones said it was too early to know the full extent of the losses of livestock to farmers. He added: "It's early days because the snow is very reluctant to go, the sun is weak and the drifts on the hills were heavy. "We will not know how many sheep are lost until the snow goes." Earlier this week, a Conwy hill farmer said his sheepdog had helped him find and rescue 70 ewes in two days. "I couldn't have done it without him. He's saved every single sheep we have saved. There was a drift here 12ft high with no air holes and he found sheep I would never have dreamed could have been under there. "He's never done it before. We've never had snow like this but he just came naturally to it."